This is the most often seen Gobrecht dollar, known as the Name on Base variety. The artist’s signature, C. GOBRECHT F. is on the rock supporting Miss Liberty. This pattern was the prototype for the Liberty Seated design that appeared on all of our silver coinage beginning in 1837, including standard silver dollars beginning in 1840. Originals and Restrikes are known, with four possible alignments between obverse and reverse dies. Two weight standards are known, 416 grains or 412 grains. 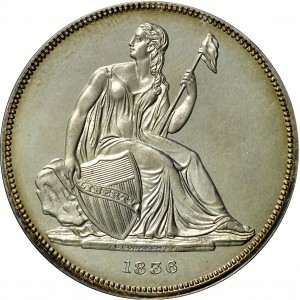 The heavier pieces were struck prior to reduction of silver coin weight authorized by the Act of January 18, 1837. Glendining's, October 15, 1970, Lot 794; Brownlee and Rowe, November 2, 1970. Name On Base type. Liberty seated on rock with shield and Liberty Cap on pole, LIBERTY on ribbon that drapes shield, C. GOBRECHT. F. (C. Gobrecht Fecit, fecit Latin for "made this") on base of rock, date below rock. 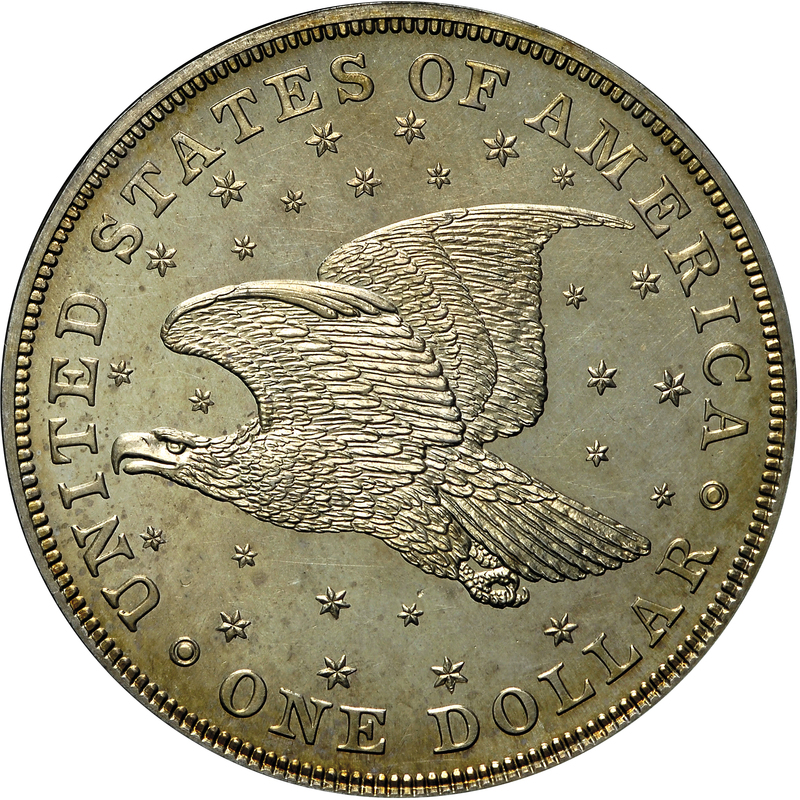 American eagle flies to left in a field of 26 scattered stars, 13 large stars to represent the original Colonies, 13 smaller stars to represent the states admitted to the Union by 1836, UNITED STATES OF AMERICA ONE DOLLAR around the circumference.